MOSCOW, February 8. /TASS/. Russian President Vladimir Putin will deliver his annual address to the Federal Assembly (Russia’s bicameral parliament) on February 20, Presidential Spokesman Dmitry Peskov has told reporters. "The president will deliver his address to the Federal Assembly on February 20," he said. According to the Kremlin spokesman, the accreditation of journalists to cover the event will last from February 15 to February 17. The president himself said during his meetings with professional communities in recent weeks that the suggestions put forward during these discussions could be taken into consideration when preparing the address. In particular, he said as much at the Business Russia forum on Wednesday. 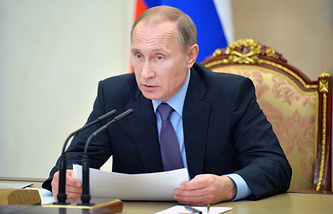 Putin’s previous address to the Federal Assembly was delivered on March 1, 2018. This practice was introduced by President Boris Yeltsin, who first addressed the parliament on February 24, 1994. All in all, he delivered six addresses to the Federal Assembly. President Putin addressed the Federal Assembly 14 times, while Dmitry Medvedev delivered four addresses as President.